Matt is in charge of meat in our house which means, unless it's in a soup, stew or stir-fry, he's in charge of the seasoning and cooking. He just seems to have the touch, whipping up amazing spice rubs on the fly and cooking things to perfection without a thermometer. Last night he had two beautiful New York Strip Steaks from the farmers market to play with. 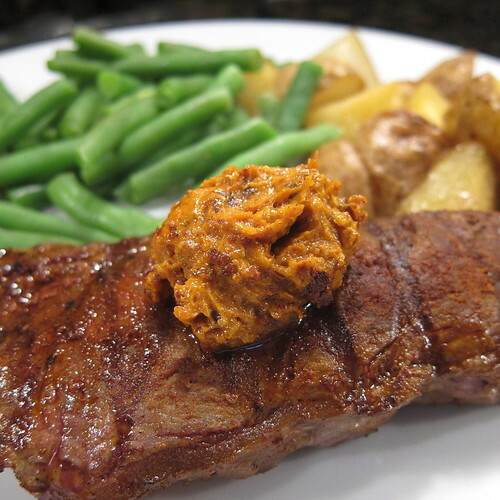 He started with a basic rub of chipotle, salt and smoked paprika which would have been good enough on its own, but then he decided to go the extra step and make a compound butter to melt over the finished steaks. Oh, was that butter good, smoky, spicy (but not too hot), garlicy, just darn good. It is quite bold, but these grass fed steaks stood up to it easily. The butter was also tasty on the roasted potatoes and Matt was dreaming about just smearing it on some good bread. Purée all the ingredients until the tomatoes and garlic are well chopped and everything is blended. i am in love with this! this could be used on anything. excellent idea! That looks wonderful! Paul has the touch with cooking meat, but this shows real flair. Whipped into mashed potatoes it would be divine! Oh Foodycat - That mashed potato idea is brilliant! I kind of chuckled about the part where you could 'freeze leftovers'. I'm not sure that would happen at our house and I can see this on a baked potato as well. Oh wow, this sounds like it would be amazing on a good steak! Yum- I'd like to melt it all over a spud!